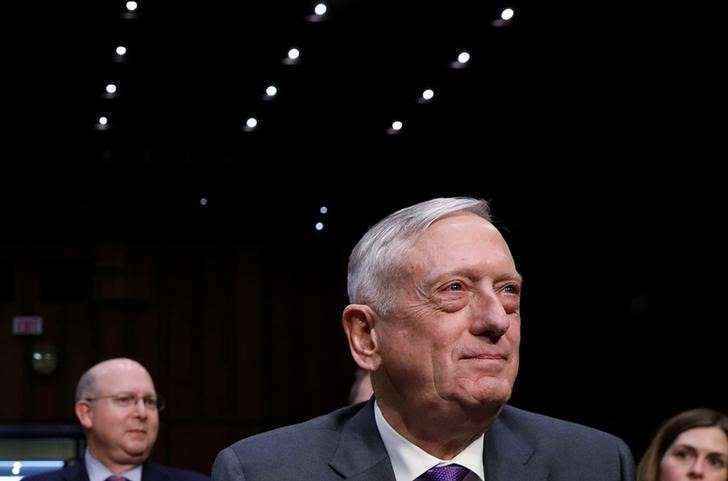 U.S. Defense Secretary Jim Mattis said on Tuesday that the United States would continue to confront what Washington sees as China's militarization of islands in the South China Sea, despite drawing condemnation from Beijing for an operation in the region over the weekend. The operation, known as "freedom of navigation," was the latest attempt to counter what Washington sees as Beijing's efforts to limit freedom of navigation in the strategic waters, where Chinese, Japanese and some Southeast Asian navies operate. "You'll notice there is only one country that seems to take active steps to rebuff them or state their resentment (to) them, but it's international waters and a lot of nations want to see freedom of navigation," Mattis told reporters while enroute to Hawaii, where he will oversee a change of command for U.S. Pacific Command. "When they (Chinese) do things that are opaque to the rest of us, then we cannot cooperate in areas that we would otherwise cooperate in," Mattis said. China's claims in the South China Sea, through which about $5 trillion in shipborne trade passes each year, are contested by Brunei, Malaysia, the Philippines, Taiwan and Vietnam.